You’ve heard variations of the quote “God looks out for fools, drunks and old people”? As I would be defined as the trifecta where that’s concerned, I apparently received special dispensation on all 3 counts because, despite the 20-car pile-up look-alike on the table, nothing actually broke. Luckily, I had gotten quite a few shots off before the wind sneezed. I wasn’t going to take any further chances, though, and we promptly whisked everything back indoors. I reset the table and took the final shots in there. So if it looks like these photos were taken in 2 different places, it’s because they were! 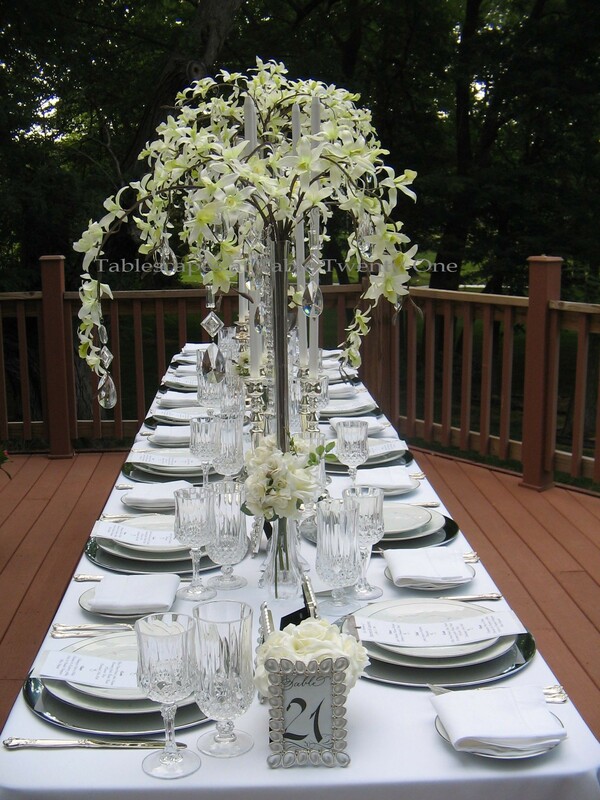 Without further whining, here’s an all-white table that could be duplicated for a wedding reception or anniversary party. I dedicate it to my friend, Lauren, and her husband, Darren, who just celebrated their 26th wedding anniversary. 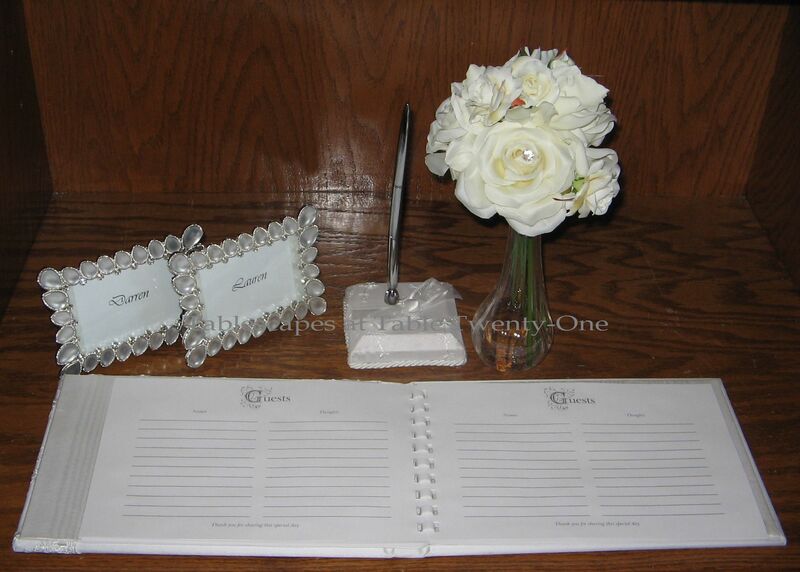 So please sign the guest book, come on in, and have a seat at…where else?…Table 21!!! I love the look of an all-white wedding reception! It’s so clean and crisp and, well, wedding-y! 🙂 Lauren & Darren’s actual wedding colors 26 years ago were pink (or was that called “mauve” in the 80s?) and white, but this is what I would envision for their anniversary celebration if I could be there in ol’ St. Louis to do this for them. White full-length linens are reminiscent of Lauren’s sweeping white gown in 1986. 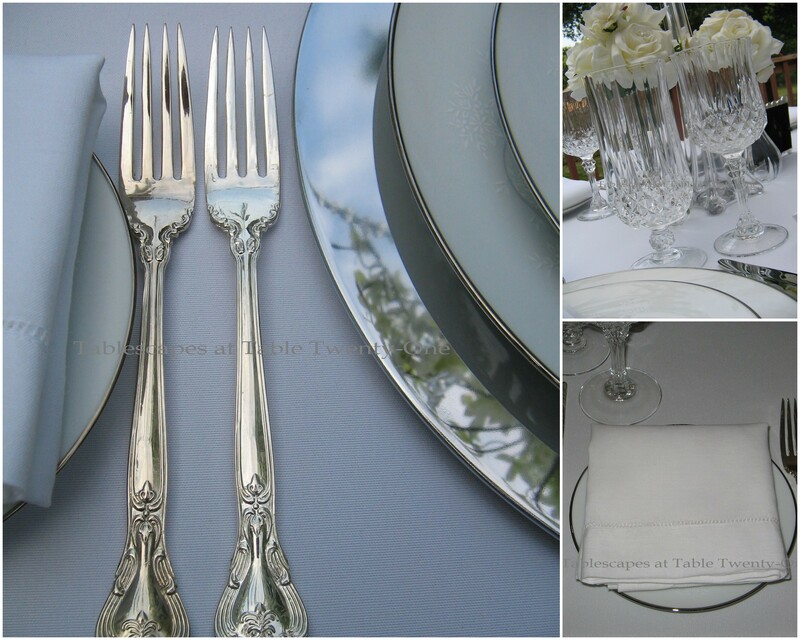 Silverplate chargers are the foundation for place settings created using my sister’s Noritake “Whitebrook” china. 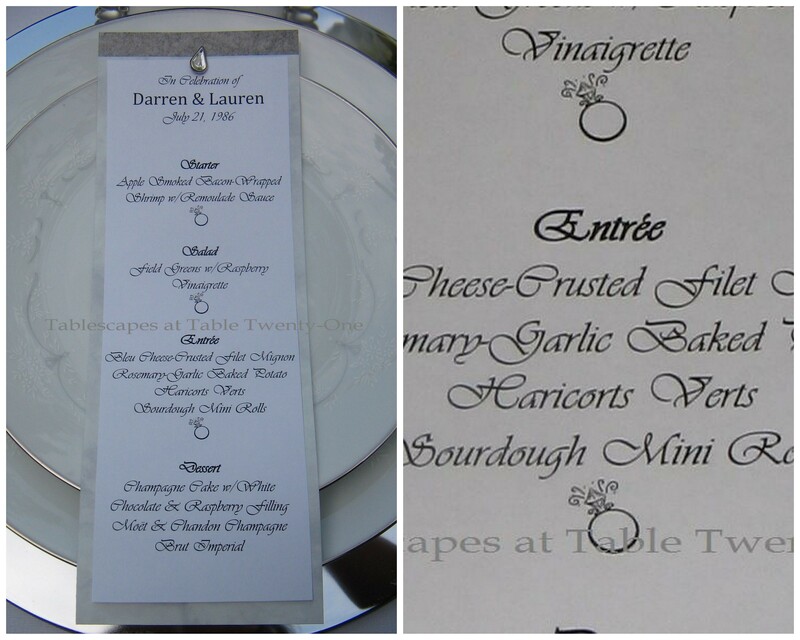 I created menus that incorporate more “bling” via the wedding ring clip art and a teardrop-shaped faux gemstone brad at the top. Estate silver from my personal collection accompanies Godinger “Chelsea” stemware with its diamond design (implied bling!) and starched white hemstitch napkins in a simple square fold atop each bread plate. 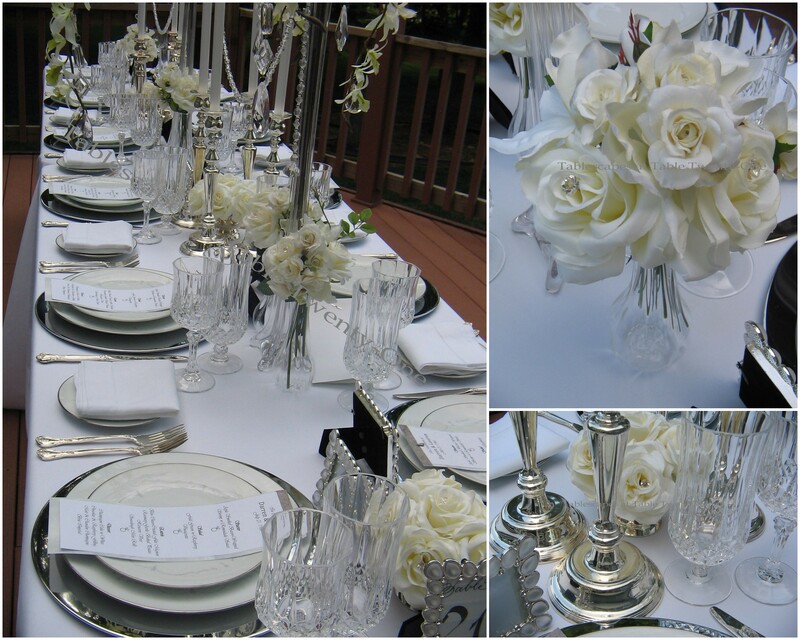 At the bride’s place setting, a trio of full-blown creamy white roses are nestled into a Baroque silver bouquet holder. 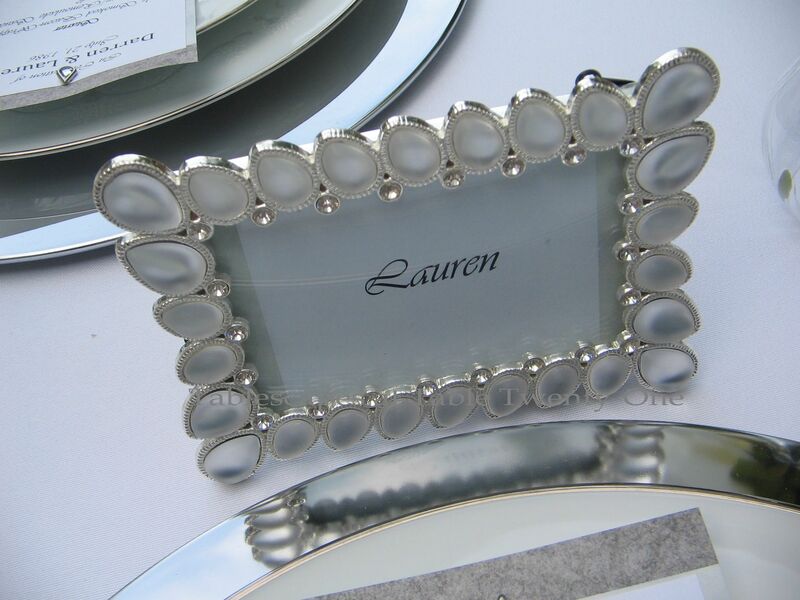 These teardrop pearl and rhinestone-studded frames hold place cards for each guest. So…did you follow the sort of theme going on here with the teardrop shape? In the menu card brads, the place card frames, the floral bling. It’s important to do that to instill continuity at the subconscious level of the brain where people kinda think, “I love it! It all just flows!” Well, yeah, it flows! It flows because you’re subtly repeating a theme. The same applies to the repeated elements down the center of the Tuscan-style table. It just…say it with me, everyone…flows! Congratulations to Lauren & Darren! I wish you many more years of wedded bliss! I’m joining Cuisine Kathleen for “Let’s Dish!“, The Style Sisters for Centerpiece Wednesday, and Susan for her 200th edition of “Tablescape Thursday” this week! You can also find me at BeBetsy.com! I can’t imagine how you created such a beautiful table and the wind didn’t break anything. This table is just over the top, but is still so elegant. Aren’t we loving MO/KS weather? Give me another week and I will own the water plant, I’ll be paying them enough. 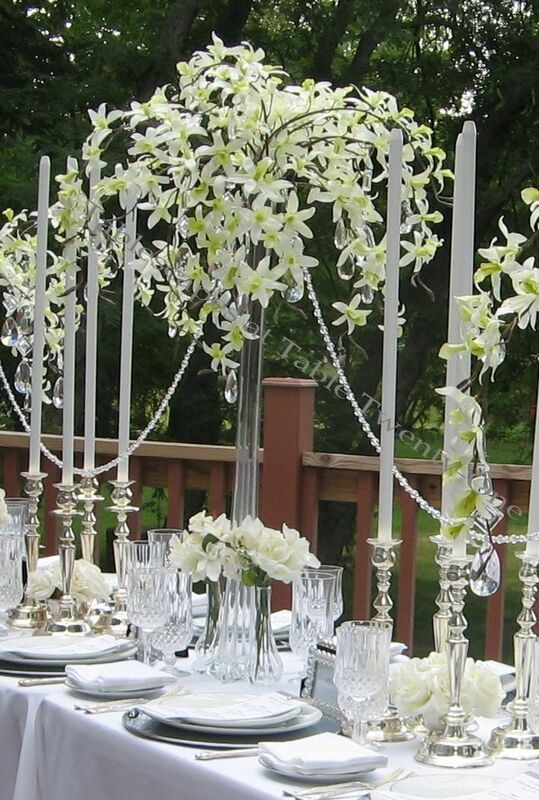 This table belongs on the pages of Brides magazine…it is exquisite…love the way you placed the garland of bling….this table would make any bride and groom so incredibly happy!….So Bride’s magazine or Martha Stewart Weddings…are you looking at this fabulous table….you should be!!! We would just like to thank all who attended from the bottom of our hearts! My, my, my! Elegant and enchanting are the descriptive words that come to mind while viewing your masterpiece. This makes me want to get married all over again! A beautiful table to say the least. Alycia, your middle name is luck. I know it is.. Using your sister’s china and those tall vases and nothing was broken.. wow.. goodness, you are so lucky. A totally lovely tribute to your friend Lauren. How lucky a girl and what an honor. It’s spectacular. Theatrical. Magical. I love the different heights. Chaining the vases together is a great idea. totally adds so much bling. the teardrops are wonderful.. Alycia.. great job once again. Have a blessed weekend. xo marlis – oh and Congrats to Lauren! and wishing her that many more years together. Your husband HELPED you? Hold me up while I faint. The table is a beautiful thing to behold, and your friends would love this, I know. They would adore the grand gestures, as do I. The china is always the type which says wedding, bride, commitment, etc. So elegant and regal without overpowering the special couple. I must say you have exquisite taste in every way. I love the tall vases and the flowers are to die for. 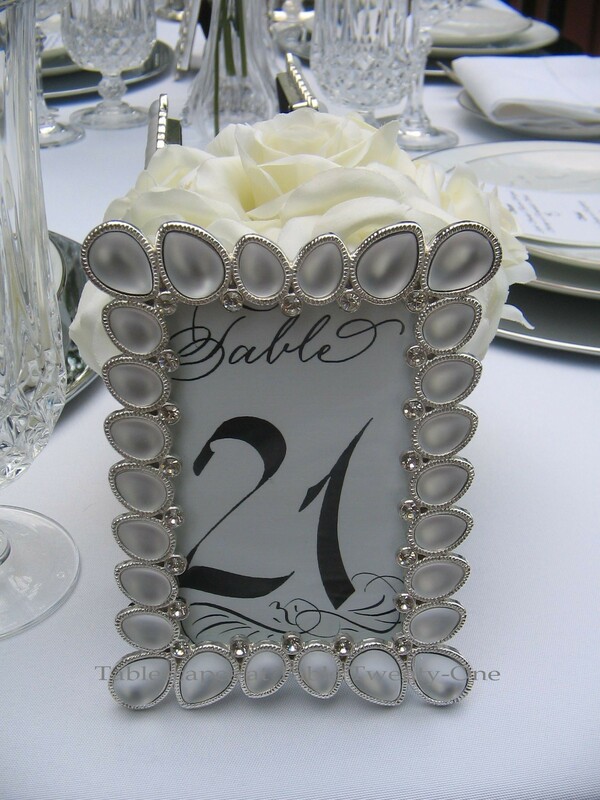 The table numbers and place cards are just perfect and I love the idea of the teardrop theme. You are just the best. That’s all I have to say!!!!! PS ( I guess I have more to say, afterall.) You really MUST stop bragging about Ramon. There will be women storming your front door. I love the whole beautiful table from start to finish. It has what I’m going to call “summer elegance”. The bling is my favorite part from the fabulous swag in the center to the baubly placecards. I do remember the Thanksgiving debacle. I would have flipped out if it happened to me (again) too. And I giggled at your “French”. I use that expression too. The more bling the better! I can always look forward to eye candy and a good laugh at Table 21. We celebrated our 36th anniversary last week. In 1976 the theme was “rainbow”. Of course my daughters got a good laugh especially at the floppy hats the Bridesmaids wore! Wow…I’m so glad nothing got broken! I guess you have to super glue everything! This is a beautiful table and I adore the floral pieces! I love their free form and feminine touch! The bling strung from vase to vase is perfection! I love all the white too, it just seems so appropriate that a wedding be done in these colors. Love the silver charges, silver candlesticks and estate silverware…it’s all perfect and I sure wish I had that much beauty at mine (34) years ago! Gorgeous! Thank goodness nothing was broken. OMGosh, Alycia! I can only imagine this gorgeous table and the wind ripping through it. I’d have been screaming my head off. I love the orchids and do you know I thought of you the other day. I was in GW and saw three very tall vases like some you have. I just kept staring at them thinking of your tablesacpes. This one for the wedding is stunning. 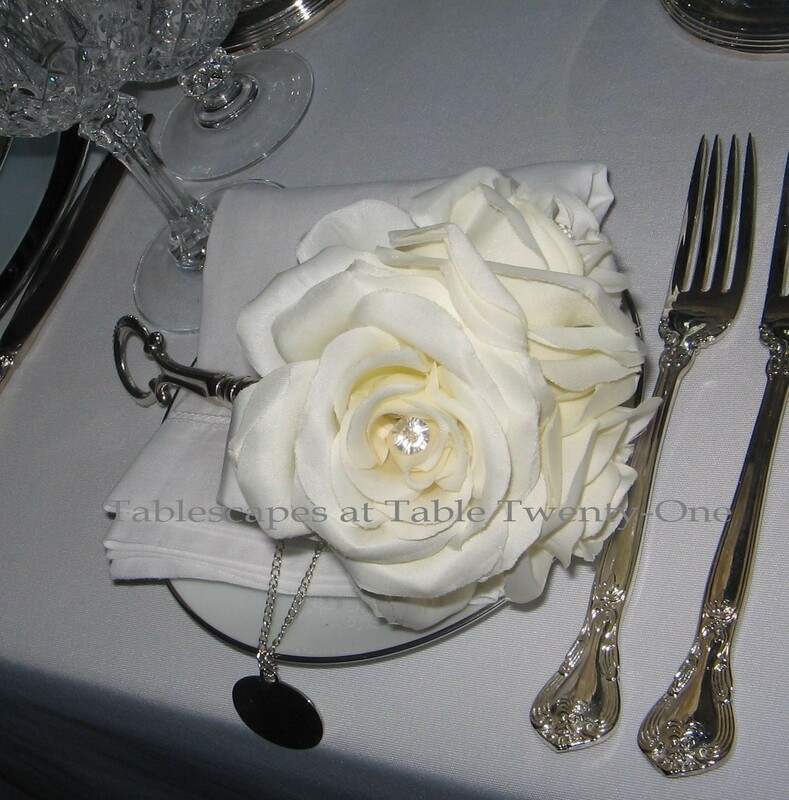 Love the white rose in the tussie mussie holder. STUNNING, GORGEOUS, ELEGANT, oh Alycia, wish this table would have been my table back when I got married. I keep scrolling up and down taking in every beautiful detail on the table and above the table, love how you used such height in the tablescape. I am so thankful that nothing broke, you are such a brave woman setting this beautiful table up on your porch. Love every detail and you do have such an eye for it. Your Tablescape is Gorgeous as always.. Thanks so much for your comment on my new Tablescape.. I hope you have a wonderful 4th.of July with your family. OK…when you mentioned that Thanksgiving incident, I have to admit, I held my breath! Oh my…I can’t imagine! But that table is GORGEOUS! I love how it “flows” (insert little snicker…). And congratulations to Lauren and Darren…Best Wishes that the next 26 years are even better than the last! Beautiful table as always. Hope you have a fantastic 4th of July and find a cool spot to watch some fireworks! Have a great weekend! Wow, this us absolutely beautiful and with all that crystal I am happy and amazed nothing broke!!!! Thanks for your sweet comment.happy 4th!!! This is the table that the wind got hold of and nothing broke….you’ve got to be kidding! My britches would have needed to go to the laundry, too. Once again I am impressed by your attention to detail. Your friends are so lucky to have you in their circle of friends… so beautiful. Well everything about this table is just so stunning. I love the entire look of it! I hope you and your family had a wonderful 4th of July. visiting from Let’s Dish! Bling is right Alycia. I love how you can go with any style or theme and come up with a great result, regardless of the weather! Oye. I can only imagine the chaos of wind gusts when you are creating a bling table! Lovely results for sure! I’m linking with Susan to my first ever Tablescape Tuesday table today. Things sure have changed over the last 4 years! We all live and learn sometimes we are more fortunate than other times. So glad nothing was broken this time and I sure feel for all the broken glass and crystal that you lost before. Scrolling down to leave my comment I saw every positive adjective in the dictionary to describe this table. I don’t think I could say it any better! Maybe Mother Nature was jealous? Thoroughly enjoyed this post and your humorous text along with it. Alycia you are awesome… The table is amazing and you are blessed. 26 years of marriage is great. Congratulations to your friends. Your blog is so beautiful and I love to visit. This is really stunning and so elegant, Alycia. I love all the bling! Beautifully done as usual! Wow — this is gorgeous! So glad that nothing in this pretty setting broke! Any bride would be delighted to use this lovely design. One of my very favorite of your tables, Alycia … and memorable always since it’s “the one that almost got away.” So thankful it didn’t! 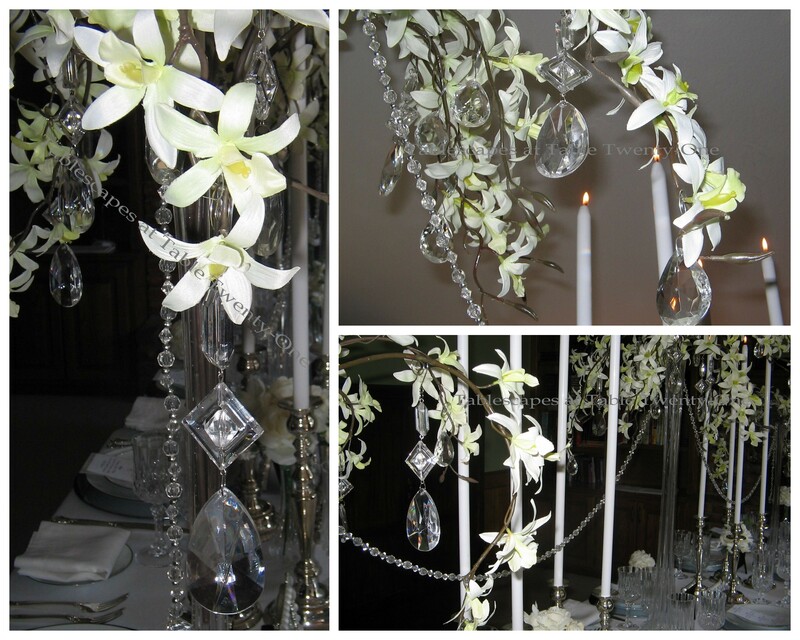 I absolutely love the dripping bling and orchids — and the addition of the silver candlesticks was exactly the perfect “break” from the sea of glass. Gorgeous! Alycia, you just ‘crack’ me up!! I just love your sense of humour! So glad nothing was broken from that rotten wind – why does it happen just when you have everything ready to photograph!? 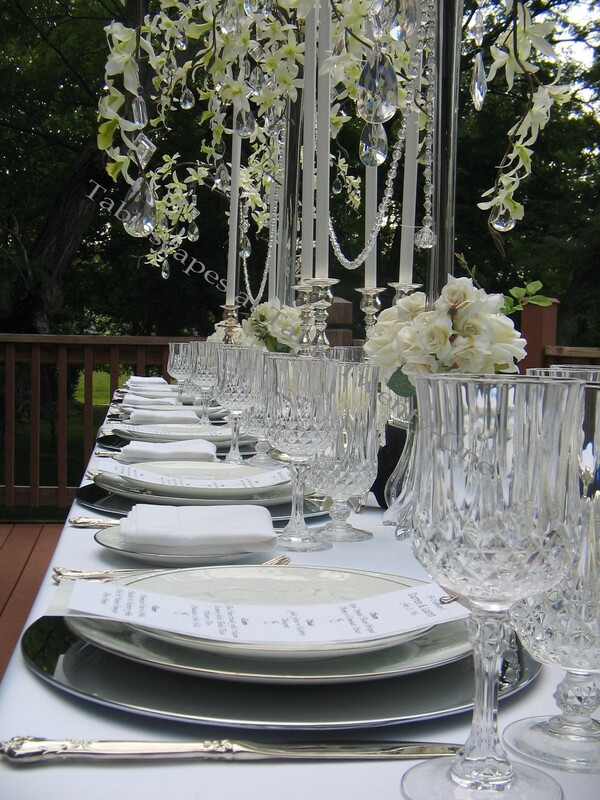 Love this table and the gooseneck vases with flowers. I like the candles too. So pretty. Have a great day. Alycia, I always know that I am in for a treat when I visit your blog! You did not disappoint this time! Beyond beautiful table and your sense of humor always has me in stitches! The things we do for “blogging” right? Leaves. Me. Speechless. You are amazing. That centerpiece is gorgeous!! I am so happy for you that nothing broke!! You must be living right!! Beautiful!! Absolutely Gorgeous! Stunning! Beautiful! Thoughtful! The thought of the wind ruining one piece of this masterpiece made me sick! But to find out that nothing, with the exception of your shorts, was decimated made my day! You are amazing Alycia! Excuse me, Ramon got up to help you? Wow! I would think I was terminal if that ever happened here! I love it, blingy but tasteful, and yes it all flows! Beautiful. Our heat wave broke, it has been brutal, even here at the beach. I adore the vases! An exquisite table, once again. Wow, my darling, once more your tablescape is stunning and the glassware is exquisite!! Ramon is wonderful or you forced him to get up, lol..Actually, I think he worries so much for you that he just does it!!! Everything amazing sweet pea, I am your big fan and you inspire me so much. I would love something like this if my daughter Alexandra got married at the beach, or something. ..I’d love to have you close by. You are AMAZING DEAR ALYCIA, your talent is inmense, no one is even close to you.. I love to see what your awesome imagination makes you come up with next! The centerpiece is so etherial and lovely with crystals hanging from it, wow..and just perfect for the beautiful white dishes and fresh and elegant white tablescape.Thank you for this eye candy. Have a wonderful and happy week. 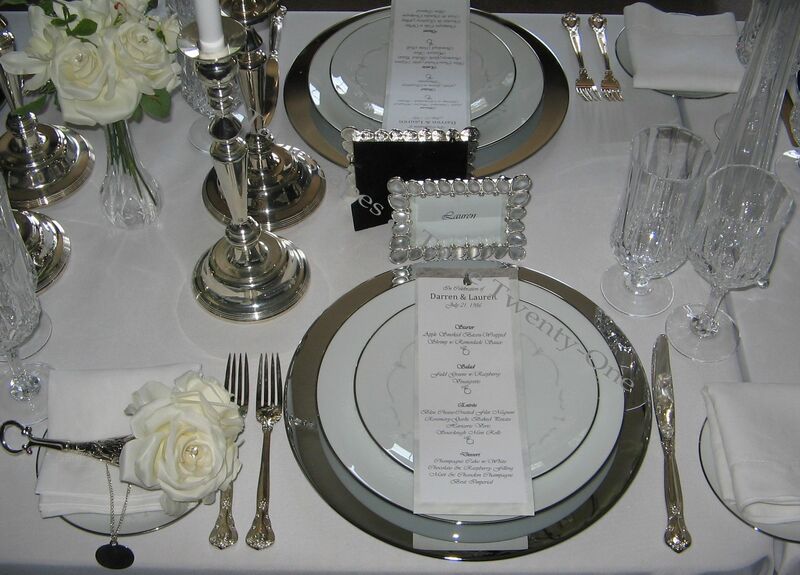 I was just rummaging around on your blog and found this exquisite table setting. I just love this! 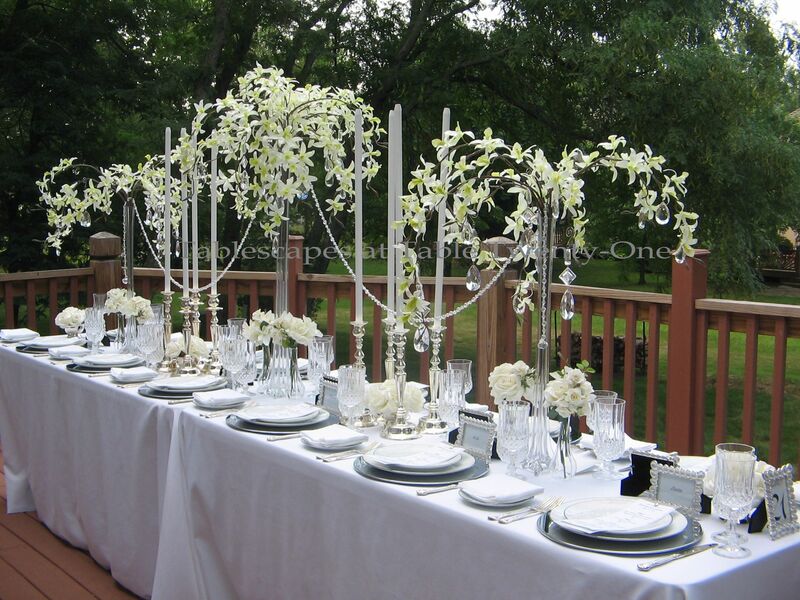 All white does look so clean and fresh, and those orchids are amazing! I love your attention to detail, it all looks so perfect. I can’t believe that a gust of wind knocked it all down. Thank goodness no harm was done.